First they came for the pedestrian plazas, then they came for the Desnudas. * But the Times Square plazas that cover a few blocks of Broadway seem to have survived. And even though the plazas are full of tourists shopping at tourist traps, New Yorkers love them. Thank you Mayor Bloomberg and Commissioner Sadik-Khan. 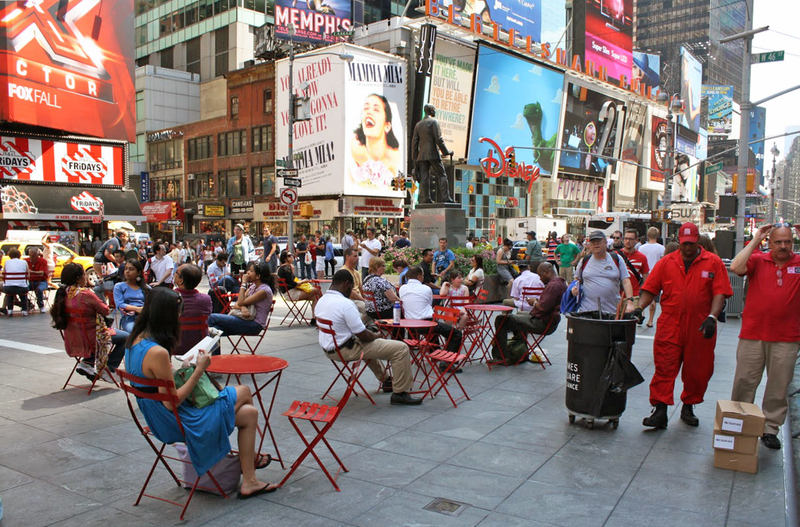 Since 80% of Manhattanites don’t own a car and at least 75% of all New Yorkers love the street design revolution brought by Mayor Mike and his DOT Commissioner, why was the survival of the plazas ever in question? Because we all grew up in the age of the automobile and our streets are still controlled by traffic engineers, who were all taught in school that their job is to make traffic flow fast and smooth, like water in a pipe. So the evolution of the revolution can be slow. Seventh Avenue still sends a torrent of cars through Times Square (see below) and sometimes makes even The Crossroads of the World seem like an auto sewer—but the revolution is happening! Happy New Year to all and to all a good night. * If you’re not a New Yorker, you may have to Google this. This entry was posted in Complete Streets, Street Design, Street of the Day, Urbanism, Vision Zero, Walkability on December 31, 2015 by Street Design.